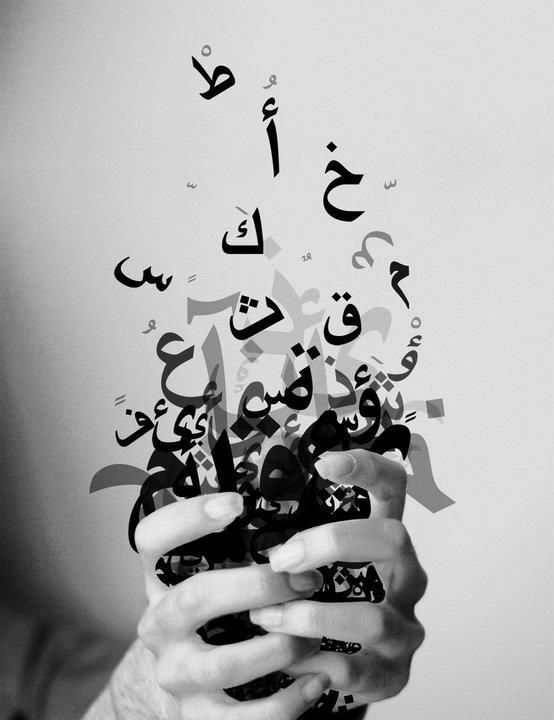 This image pretty much sums up my initial feelings towards Arabic; the letters felt like strange squiggles slipping through my fingers. Although the Arabic alphabet is worlds apart from the Latin one I’m used to, I've begun to find comfort in the logic of Arabic. Once you know the sounds of the alphabet you can read basically anything. You’ll have no idea what it means of course but you can at least sound it out. This is in stark contrast to English as anyone who’s ever attempted to teach English to young children will be aware of the oddity of English pronunciation. You only need to look at words like ‘tough’ or ‘knight’ or have a quick glance at the photo above to see that English spelling is more like a graveyard, haunted by the ghosts of dearly departed sounds and letters. We don't acknowledge their existence but there they are cryogenically frozen inside a language that’s simply moved on without them! After studying the way Arabic is written, it came as no surprise that Arabic is the language which gave rise to algebra and geometry. The Arabic script is designed for the letters to flow together depending on whether they’re at the beginning, middle or end (where it ends with a flourish) unlike a lot of English handwriting where the letters seem to be allergic to one another! 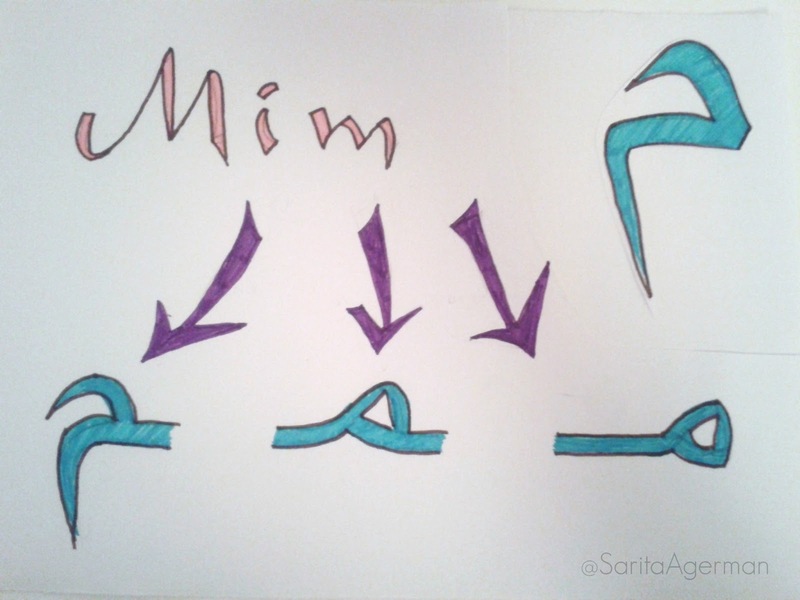 Take the letter Mim for example (above), the equivalent of the English ‘m,’ which has three forms when written: at the beginning, middle and end. You can see this using the example of ‘Ta’ which looks like a smiley face. 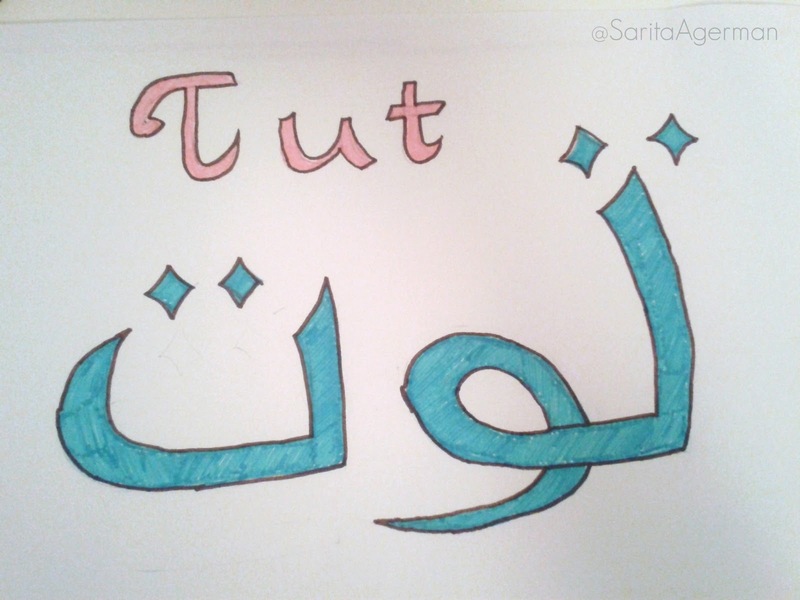 One of my favourite new words in Arabic is ‘tut,’ pronounced ‘toot,’ which means strawberry (below). I like it because it looks like a snail wearing a squiggly cap. It’s a good example of how letters change depending on where they are in the word. Although the sound of both T’s is identical, the‘t’ at the beginning of the word looks completely different to the‘t’ at the end. Have you started to learn a new language? 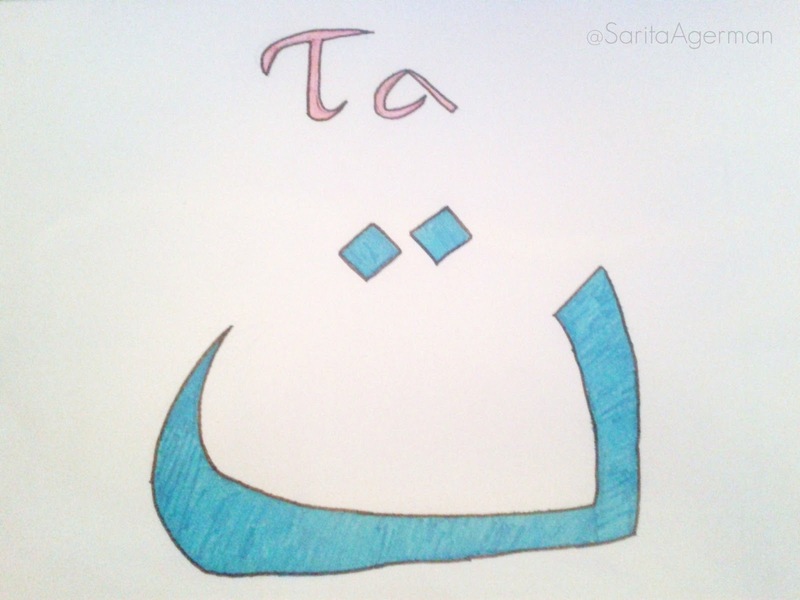 Have you ever tackled the Arabic alphabet? Today's link is Learn Arabic with Maha, an Israeli Palestinian living in Italy. I began watching her videos two years ago as a way of improving my Italian and now I'm going through her English videos to learn Arabic properly. She also teaches Hebrew and Italian; and speaks several other languages too. Here are some of her lovely videos including several on culture and food as well as Arabic itself. Enjoy! & How Often Do You Speak Turkish Without Realizing It? Oh very handy article sis. Thanks for sharing! I love Arabic. I just wrote about. It is an amazing language. Its difficulty denotes its deepness. I need to learn it, and that's what I am doing. Thank you for your comment - I like your point about the difficulty of Arabic revealing its depth. Do you have a link to your post by any chance? I think copying things down is the way forward in Arabic - otherwise I'd never remember anything! You're right about the honey and lemon! they (female), you two (male), you two (female), they two (male) and they two (female) - I'm not kidding! 2) Every verb, adjective, and direct object must be conjugated to agree with one of these twelve. 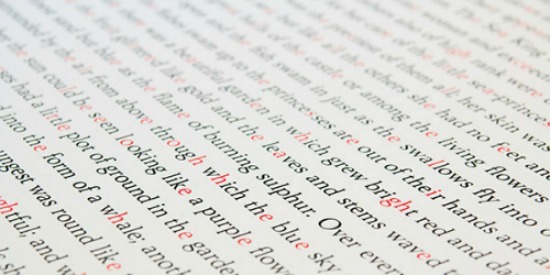 3) The plural of most nouns is a completely different word. You have to guess when this applies. 4) There is no relation to English - ever - thus, a creative mnemonic device is always required (this part can actually be quite fun). 5) Every letter in Arabic script changes depending upon whether it's at the beginning, middle or end of the word - and the letters all pretty much look the same anyway (picture a cursive, lower-case "w" with some dots around it). 6) Vowels are left out of Arabic script completely. 7) Arabic dialects are so different from one another that Arabs do not always undersand other Arabs. 8) Egyptian Arabic truncates approximately half of every word and always omits certain letters. 9) There are three H sounds, two S sounds, two D sounds, two T sounds, three TH sounds, two K sounds and Arabs seem to know the differences between them. 10) My personal favorite: the xayn sound: This is what my Arabic book says about it (verbatim): "You use the necessary muscles when you gag, and if you put your fingers on your throat and make yourself gag slightly, you'll feel the muscles you'll need to pronounce xayn." Note: this letter is in almost every word! Elisabeth - I love your method of writing English words phonetically in Arabic script to get used to the script. I'm going to steal that idea! And yes, my throat hurts after practicing for a while. Thanks for your post and comment - it made me chuckle!